on verso signed, titled, dated Oct. 1976 and inscribed "Acrylic Polymer W.B." / "Toronto"
When reviewing the 1980 exhibition Jack Bush: Paintings and Drawings, 1955 - 1976, critic Hilton Kramer eulogized Bush while describing his last series of works - aptly titled Handkerchiefs - commenting that they “constitute...Bush’s finest work. There is something eerie in the spectacle of all this strength gathering force on the eve of the artist’s death, quite as if he were transferring his vitality to the canvas...This is part of what we mean when we speak of "late" art. There are fine painters who never achieve it - Picasso was one who didn’t - but Bush achieved it triumphantly.” This is a bold assertion about a painter whose work spanned 40 years and who enjoyed almost 20 years of critical acclaim. Perhaps this comment can be best understood through Bush’s own assertion, months before his death, that part of the artist’s job is the management of influences. In this final series of works, we see Bush not just managing, but mastering, so much of what influenced him throughout his career. 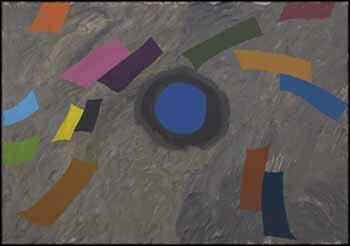 As noted by Kramer, one of Bush’s undeniable influences was Henri Matisse. In the Handkerchiefs series we see reference to Matisse’s late cut-out works, in particular works in which bits of irregularly cut square and rectangular paper pieces intermingle across an otherwise blank picture plane. This Handkerchief work demonstrates Bush building upon Matisse’s use of flat, overlapping rectangles by rendering them in scrubbed, almost translucent acrylic paint, and by allowing them to seemingly drift off the edges of the canvas, into the liminal space at its borders. Critics often speak of Bush’s “love of things,” which is to say, the consistent influence of the natural world on his ostensibly abstract compositions. This is evident in the visual traces of flags in his early abstracts, of garden imagery, or of women’s clothing (in the Sash series as well as Dorothy’s Coat, from 1972). The "real" world is certainly referenced here, not just in the central moon form, but also in the way in which the shading around this moon suggests a certain recession into a shallow space in which the handkerchief forms float like confetti. This central circular motif appears elsewhere in Bush’s work, but often as a red disc (for example, in both Day Spin and Night Spin of May 1976, which were given their own room at the 2014 - 2015 retrospective at the National Gallery of Canada in Ottawa). This motif appears in Bush’s work as early as 1947, often in works related to his anxiety, but here, it feels joyous and free, thanks to the abstract handkerchief forms (indeed, this is the only work that features the combination of circular motifs and handkerchiefs). Bush also references the natural world via the strong influence of jazz music on his compositions. Other works in the Handkerchief series, such as Mood Indigo (1976), owned by the Metropolitan Museum of Art, draw their titles from jazz standards – "Mood Indigo" was a tune written by Duke Ellington and Barney Bigard in 1930. While Moon Gust does not derive its title from jazz, it is reminiscent of the song “How High the Moon,” released by the Benny Goodman Sextet in 1947, and something of Goodman’s gentle clarinet and Jimmy Rowles’s syncopated piano find an echo here. Bush’s works speak to a jazz musician’s mentality - a connection discussed by Karen Wilkin in her 2014 retrospective essay, where she likens Bush’s ability to create variations on a theme to the ways in which a jazz musician improvises over familiar tunes. In jazz, too, it is common to "quote" other great musicians’ solos, or bits of famous songs. The ability to improvise is likened to mastery: of the influence of past greats, of theory, but also of personal expression - a mastery that Bush certainly possesses in this late work.